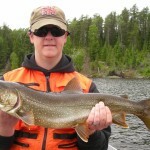 The Lake Trout is a truly Canadian species that occurs from the east coast to the west as well as in the north. Almost all of its natural populations are in inland Canadian waters or the Great Lakes. 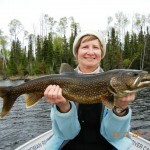 Known in different parts of Canada as the Laker, Mackinaw trout, grey trout, salmon trout, togue, touladi and half a dozen other names, the lake trout is a member of the salmon family. It’s one of the largest of the freshwater fish, and has a reputation for being a challenge to catch and of a superb eating quality. Considered the hardest fighting freshwater fish! 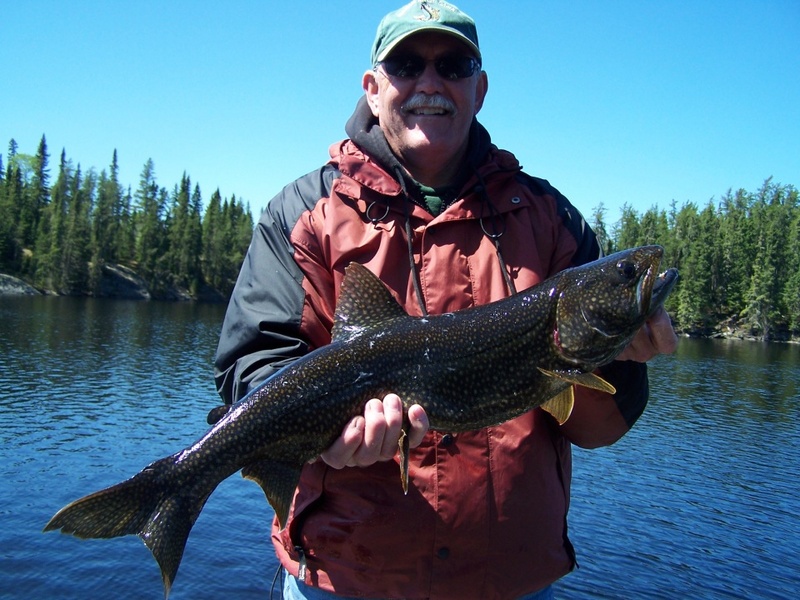 Lake trout can vary significantly in appearance depending on the body of water they inhabit. In general, they tend to be dark-coloured, ranging from black to green, with white spots on their tail, head, body and fins. The lake trout’s torpedo-like shape makes it a very efficient swimmer. It has a large, rounded head, with well-developed teeth on its jaw, tongue and the roof of its mouth. 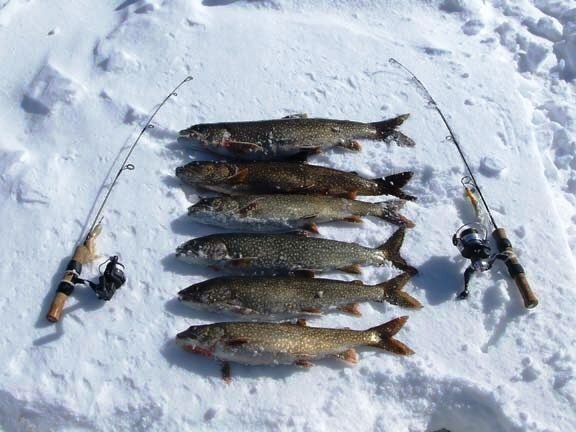 The lake trout’s deeply forked tail distinguishes it among its fellow swimmers. It’s unlikely you can reel in your lure faster than a Trout can swim. In small lakes, these trout grow to between 35 and 42 centimetres; in larger waters they can grow to more than one metre. 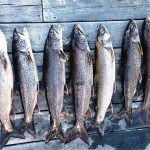 The record Lake Trout weighed almost 46.3 kilograms (102 lb) (netted) with a length of 127cm (50 inches). Trout live well over 70 years! 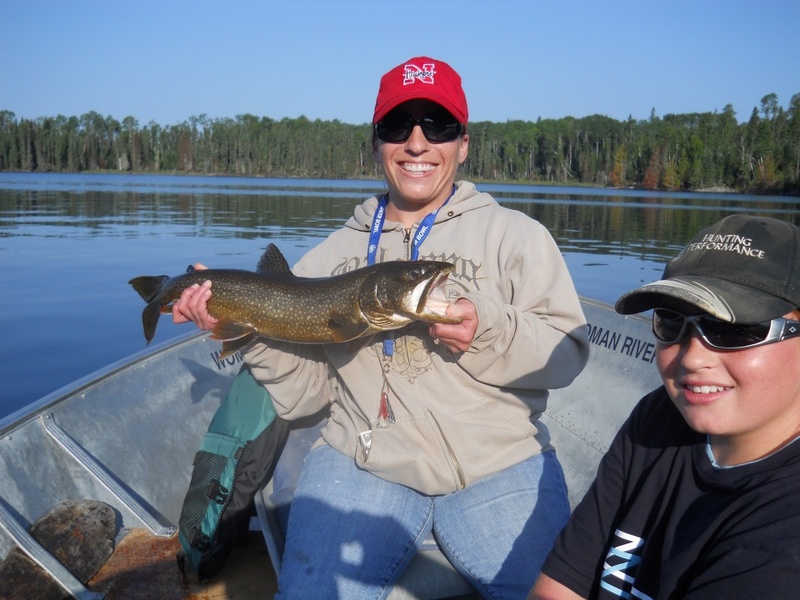 Habitat can greatly affect the lake trout’s diet. Young fish tend to feed on small water bugs, crayfish and freshwater shrimp as well as worms that live in the sediments at the bottom of lakes. 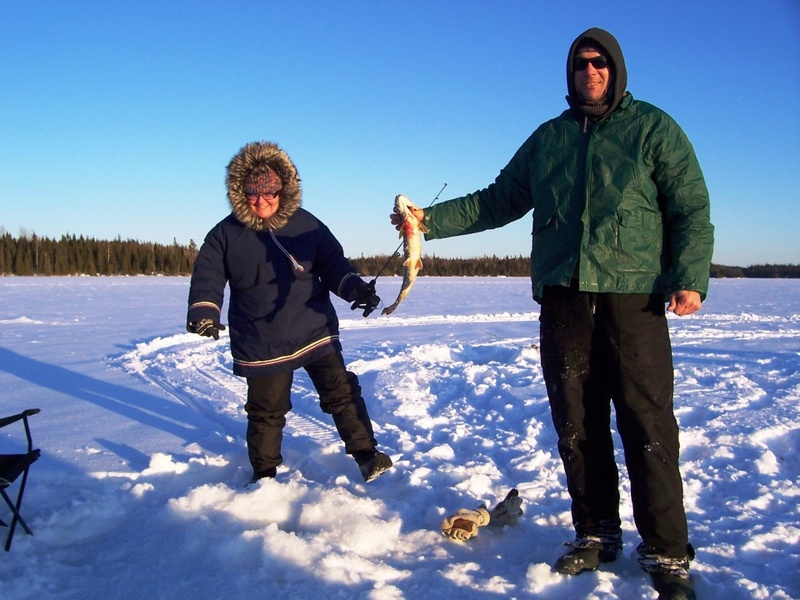 As they grow larger and mature, many lake trout switch to a fish diet, fuelling further growth by eating ciscoes, small white fish, sculpin and minnows. 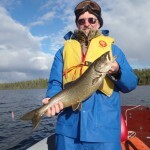 In some cases where lake trout are the only fish in a lake, some become cannibals and feed on other lake trout. This species has daytime feeding patterns, tending to eat at dawn and dusk. 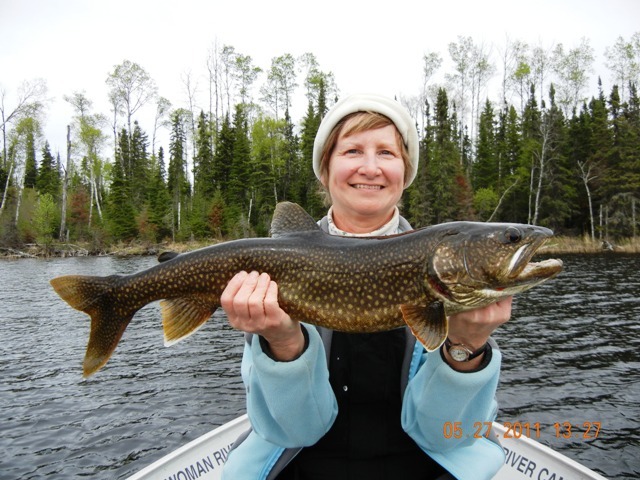 Female lake trout lay their eggs in the fall when the water temperatures are between 10 and 12 degrees Celsius. For reproduction (spawning), they generally choose water that is two to three metres deep and close to the shoreline. The peak spawning time is about one hour after dusk. 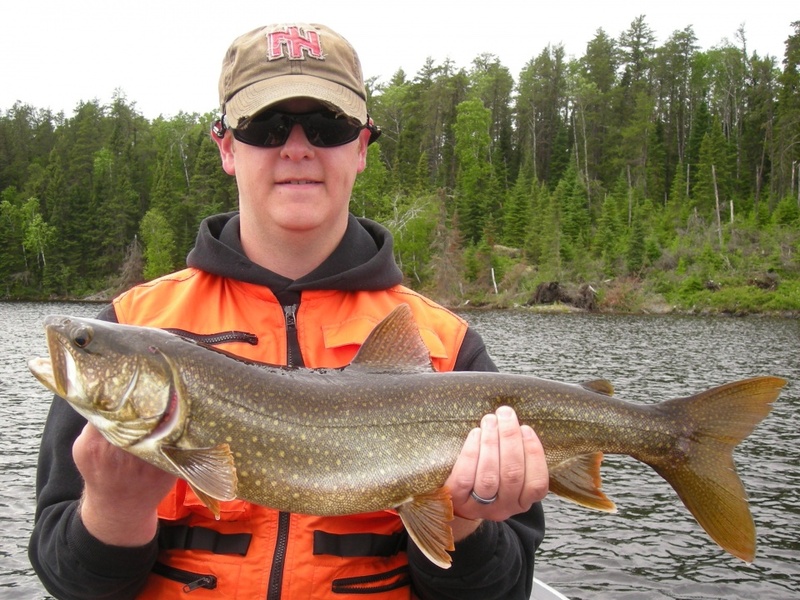 Lake trout tend to have small spawning areas-only a few square metres in size. They typically spawn on coarse, gravel areas where the rubble protects their eggs from harm and there is enough water movement to ensure a steady supply of oxygen. 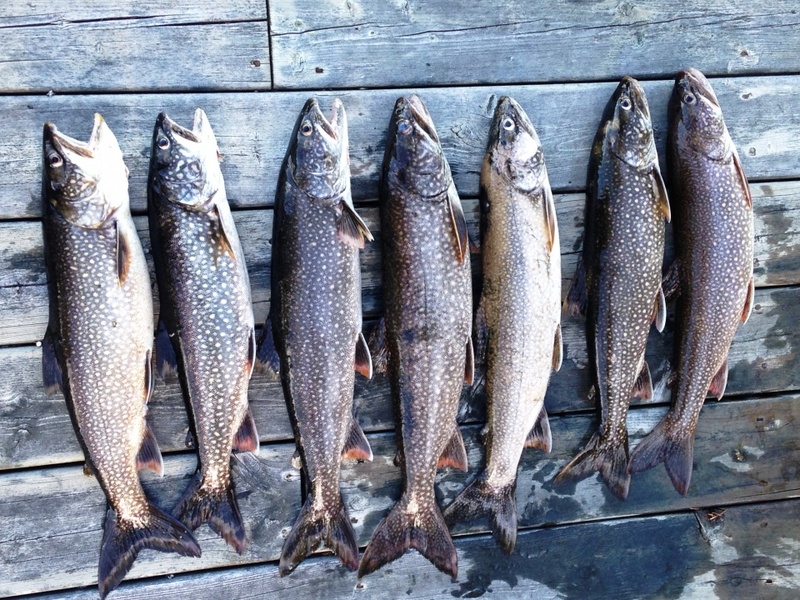 Lake trout grow quickly in their first five years. 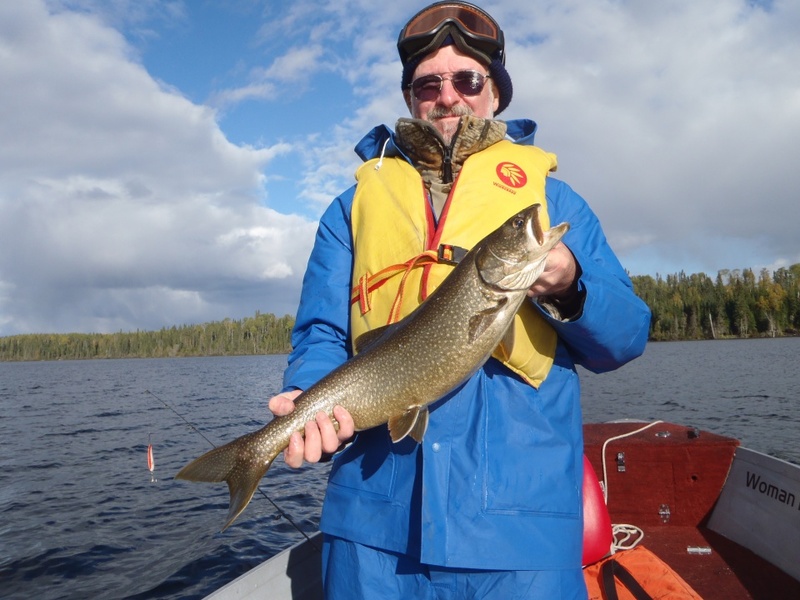 They generally reach maturity between five and 10 years of age and enjoy a fairly high annual survival rate in areas with limited fishing: once they reach maturity, about 84 percent of lake trout live from one year to the next. 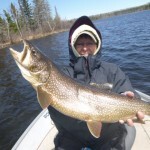 25% of all Lake Trout live in Ontario. 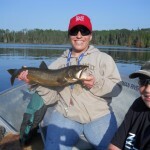 Woman River Camp is located on Trout waters and has access to 6 additional great Trout lakes. 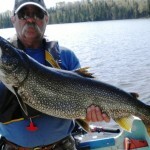 We certainly are blessed with some of the best fishing in Canada! When trolling, turning to the Port side will slow down the Port side lure and speed up Starboard side lure. The single most important item you must remember is remembering. 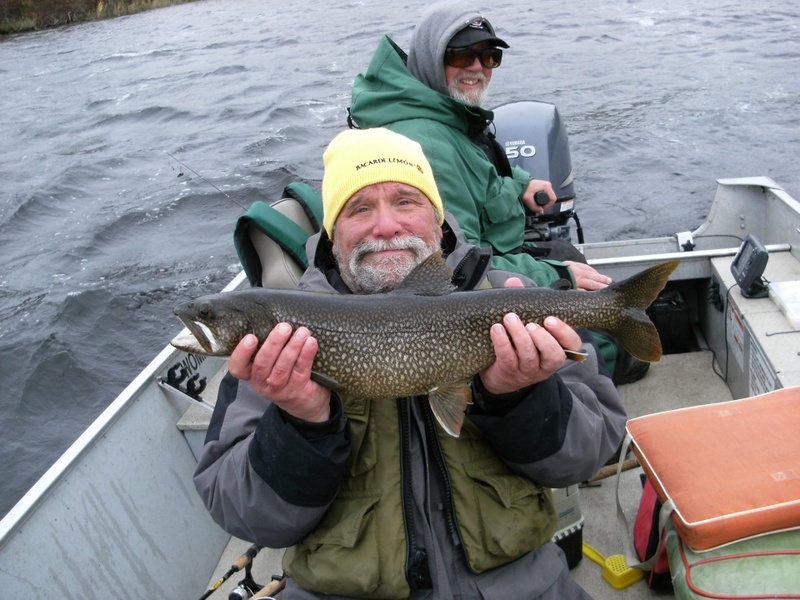 To consistently catch Lake Trout, you must remember not just what you were doing with the lure, but the boat, direction, speed, what was on the graph, depth….everything counts. What you remember you can duplicate and eliminate the guessing. Springtime Lake Trout are explosive bulldogs. 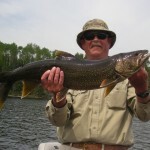 You can be casting for Walleye and hook into a torpedo Trout that will burn up your drag in a hurry. Lakers thrive during the ice out period. 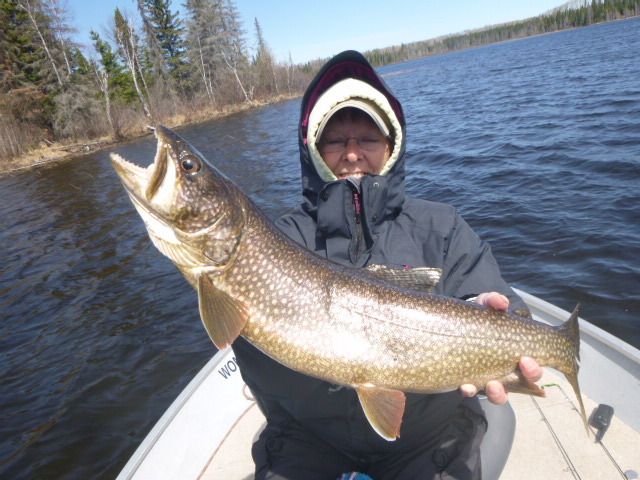 Water temperatures are still cold and spring winds restore oxygen levels in surface water making the shallows great places to find cruising Lake Trout. Sandy bays and south facing shorelines are areas where insects and minnows first show signs of life after a long winter. Find the food and you will find the fish. I love to cast, and you never know what species of fish will be attacking your presentation in the spring. Use your electric trolling motor or backtroll along a shoreline casting perpendicular and parallel to the shore. In sandy bays, I like to drift across and use the motor to make minor adjustments. Sometimes more than one drift is needed to cover a bay. Cast in every direction. Tackle selection – Cast light weight spoons like William Wobblers, salmon spoons, or a small inline spinner like a Blue Fox Vibrax. Use a medium action rod with a fast tip teamed with an open or closed face reel, spooled with 8-14 lbs test line. The light lures will slowly flutter down giving you a chance to close the bail and start your retrieve. I don’t recommend trying to chuck one of these light spoons with a baitcaster. Sooner than later the spoon will float in the air and you will either put the rod away for the day or spend some time removing the bird nest. Instead, use your baitcaster to throw crankbaits like Rapala Husky Jerks and Cotton Cordel Ripplin Redfins. Retrieve at different speeds with the occasional pause. Change it up until you start connecting with fish. 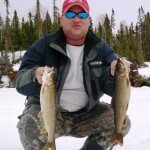 There are three trolling techniques that consistently work for Lake Trout in the spring. The first and easiest is to start heading in the desired direction and then take a long cast off the back or side of the boat. When fishing with more than one person in the boat, you have to be on the same page and use lures that run properly at the same time. 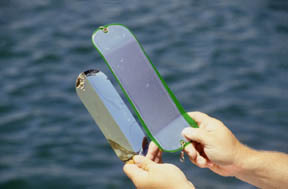 Too light or an out of tune lure and you will most likely see it flopping on the surface behind the boat. Troll parallel to shorelines zigzagging in and out to move your lures. Troll over points and then come back around and troll parallel to points heading out to deeper water. Just remember what you were doing when a fish strikes. Forward troll with ½ – 2oz. jigs. Preferably a jig shaped to break the water with the eyelet on the front. Attach a twister tail with some scent. Minnows or a piece of sucker meat (where legal) are pretty enticing. Find bottom with your jig then start trolling, constantly pumping your rod up and letting the jig fall back down. Follow the jig down so you don’t leave any slack line. Bounce and drag you bait along the bottom making noise and stirring up sediment. You will cover lots of water and stay warm doing it. You will need a medium heavy rod with 10-20lbs test line. Use this technique in waters ranging from 5-20ft. Three-way-rig or what Wisconsin anglers call a Wolf River Rig. Take a three way swivel and attach a drop line anywhere from 2-5ft long. (Be sure to use line with a lower lbs test than your main line. This way if the weight becomes snagged, in most cases, you can break it off and keep your lure. Attach a snap swivel and then hook on a bell sinker or pencil weight to the end of the drop line. Your weight needs to be heavy enough to make contact with the bottom when trolling. Next, use fluorocarbon line and tie it to your three-way with a good snap at the other end enabling you to change lures without shortening your leader. The fluorocarbon will be invisible to finicky fish. I usually make my “lure lead” anywhere from 3ft to 8ft. Definitely not longer than the distance between the tip of my rod and the surface of the water when I’m standing. If you are fishing by yourself, you will be able to bring the fish alongside the boat with one hand and still have enough reach to net it with the other hand. The long lead prevents the three-way-swivel from hindering the action of the lure. You can be efficient by pre-tying different length leaders and drop lines. Spool them up on your spinner rig storage device or a piece of pool noodle works well. Work depths from 10-30 ft in the spring. The rig is meant to be fished slowly in order to maintain a 45 degree angle of your line to the water and contacting bottom. Floating crankbaits, live bait spinners, light spoons and even slow death hooks with a crawler work great. 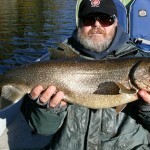 Lake Trout like to cruise shoreline. Find a good spot to sit on shore, tie up your boat or anchor next to a point with water reaching down to about 20ft. Fresh Lake Herring from your grocery store work really well. So do minnows or a piece of cut bait like sucker. Set your medium action rod up with an egg sinker, bead, barrel swivel and then about two feet of line and tie on a 3/0 circle hook. Attach a dead herring through the back perpendicular to the fish. For a live minnow, run the hook through the back parallel and beside the dorsal fin. This won’t break the minnow’s back and keep it alive longer. Cast your offering and let it settle to the bottom of the lake. 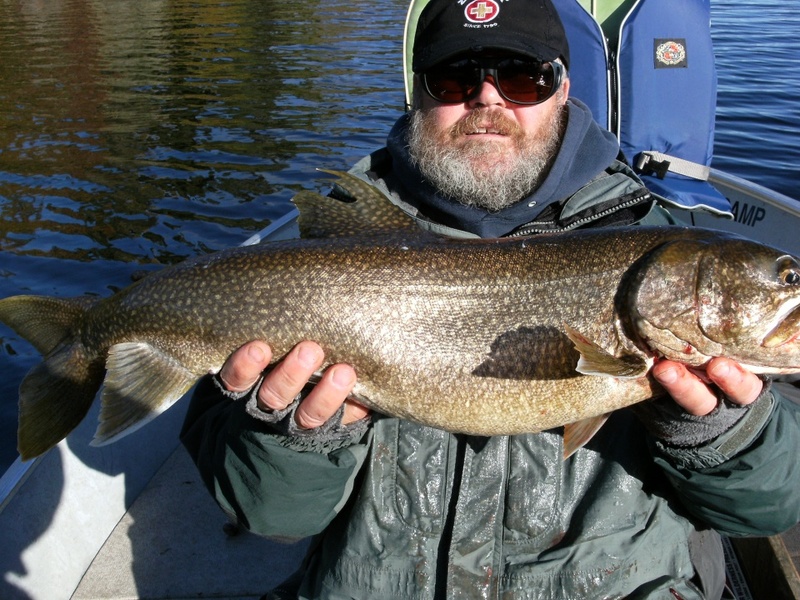 When a cruising Lake Trout picks it up, it won’t feel the weight. Use a strike indicator like an ice fishing bell and lighten up your drag so the fish can run without pulling your rod into the lake. Circle hooks are the best choice for a hook because they seldom deep hook a fish. This is a great way to spend shorelunch or an afternoon beside a campfire. Slip bobbers can be used in the same area as Soaking Baits. It’s best done with a live minnow set about 10ft below the bobber. Add a few pieces of split shot a foot up from the bait not to impede the minnow’s movement too much but keep it down in the water. Keep an eye on your bobber and recast when it comes too close to shore. Casting – using your medium to heavy action rod to cast out lures in a fanning pattern over deep water. Preferably where you know there are Lake Trout or see fish on your graph. Chuck spoons, lipless crankbaits and jigs keeping the line tight to feel strikes while your lure is sinking to the bottom. Once on the bottom, pop the lure back until it is vertical under the boat. Now start jigging with full lifts of the rod and follow the bait back down. 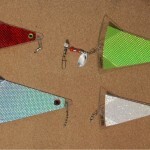 Jig a few times then crank the bait in some and repeat jigging until you are ready to cast again. If you do miss a fish, start reeling as fast as you can. They will chase after it thinking its prey is trying to escape. When you do hook a fish, take your time reeling it in. 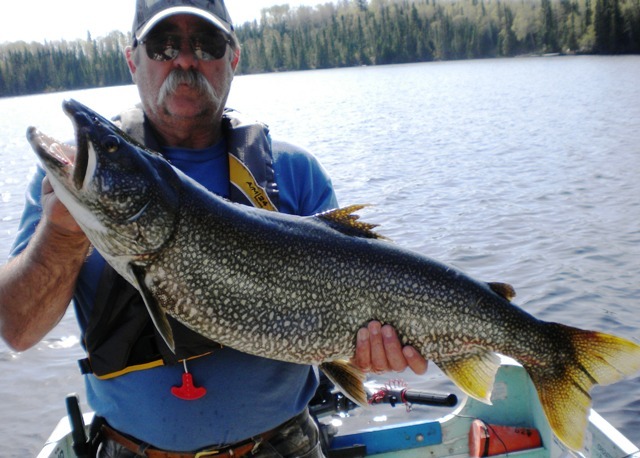 Lots of times it isn’t a Lake Trout but a Walleye or Northern Pike and these fish are guaranteed to die from the bends if brought up too fast. 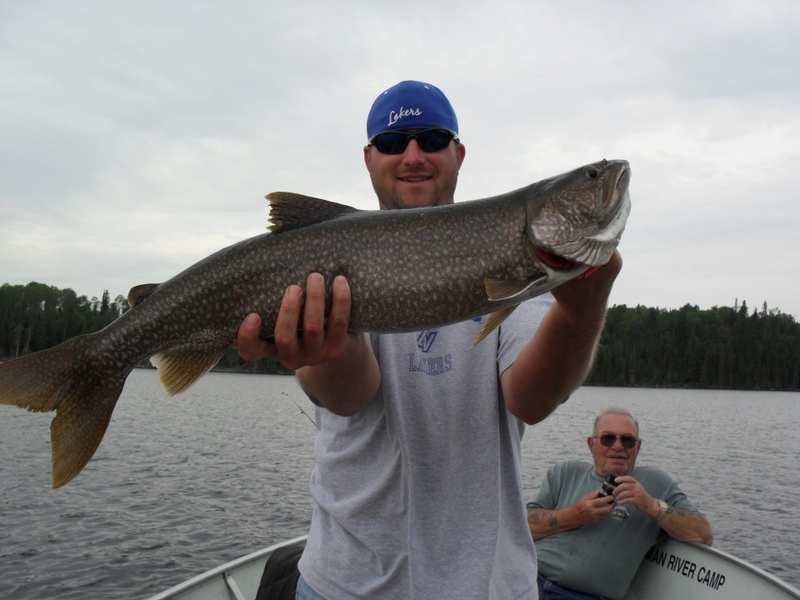 Long line trolling – There is an art to trolling for summertime Lake Trout. You must pay attention to a lot of variables to consistently be successful. This is where your memory comes into play. How much line did I have out? Use a line counter. How fast were we moving? Use a GPS to watch speed. Was I turning? What direction? 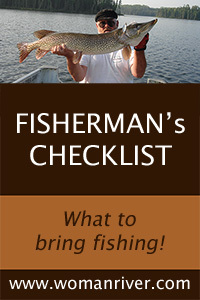 Keeping track of all these variables enables you to repeat your actions and catch more fish. Use inline keel weights or diving aids like Dipsy divers or Pink Ladys to put your lure in the right place. Using a Dipsy will also help spread out lines behind the boat covering more water. Old school anglers use steel line or lead line to put the lure at the right depth. Lure selection is wide open! This method is by far the most precise and some say productive when trolling for Trout. A manual crank (usually 1ft per crank) or sophisticated electric downriggers are used to lower your lure to a precise depth. Your line is placed in a release which is attached to a cannon ball that is lowered on a steel cable to the desired depth. When a fish strikes your lure, it pulls the fishing line from the release allowing you to fight the fish uninhibited. Anglers need to know the depths and preferably the lay of the underwater land. A sudden change in depth can quickly snag downrigger balls resulting in the loss of expensive equipment. 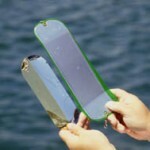 Use a lake map, depth finder and GPS to lay out a good route for downrigging. The length of line between the release clip and your lure can be anywhere from 3-30ft or longer. The short length is great for sharp turns reducing the chance of hooking two lines together. Use spoons, spinners, crankbaits and squids behind a downrigger ball. Cut bait works well. 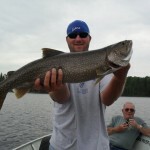 When anglers start down the path of downrigging for Lake Trout, the obsession has started! The term “trolling attractors” is a generic way of organizing a host of trolling hardware designed to get the attention of trout and other species. 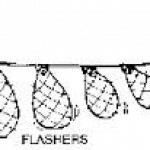 Some of the common attractors in use to target lake trout include “dodgers”, “lake trolls or cowbells” and “fish flash”. 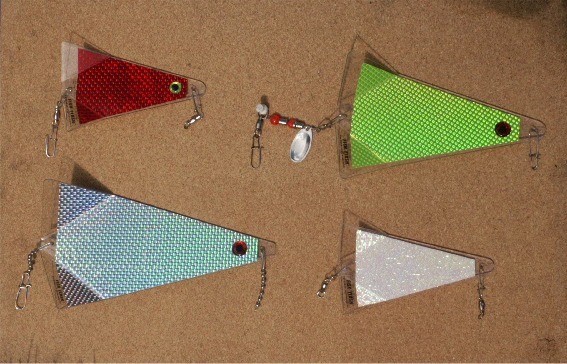 All of these attractors come in various sizes and of course color options. No single trout attractor is the “go to” answer every day on the water and most good trout fishermen carry a selection of all three on board with them. When you start adding these attractors to your lines is when you need beef up the rods and start using rod holders. Use a trolling speed between 2.7-3.2kph (1.7-2 mph) when fishing with an attractor. Trout remain in their summer range until fall turnover occurs. Water is most dense (heaviest) at 4C (39F). Cool fall temperatures lower the surface temperature and one day usually with a strong north wind, the heavy cold water flips over and mixes with the rest of the lake. Now water temperatures will be the warmest on the bottom of the lake and soon the surface will be the coldest and freeze. 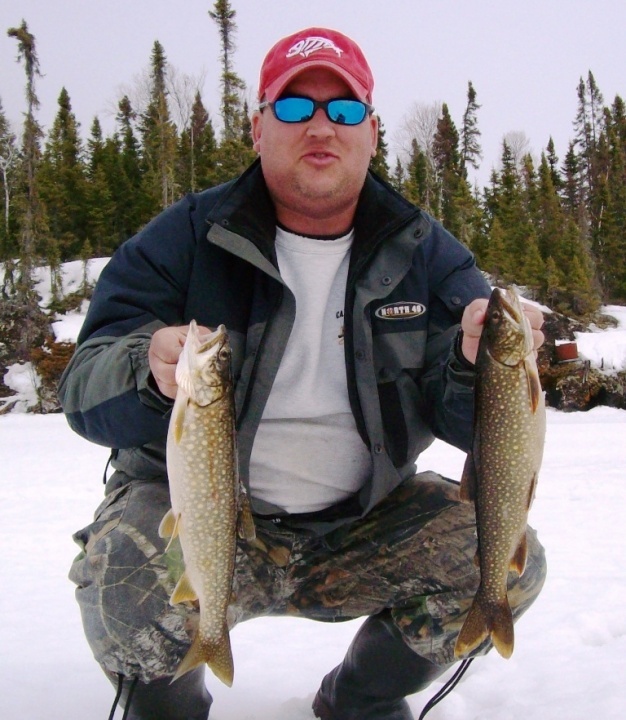 When the lake flips, that is like a switch for Lake Trout to come up from the depths and prepare to spawn. It’s time to start casting again. Throw suspending crankbaits like Rapala Husky Jerks and Cotton Cordel’s Rippling Redfins. Don’t forget the spoons! One of my favourite is a 1oz Daredevil red/white. This time tested spoon boats a lot of fish! 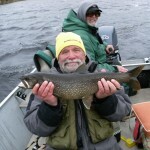 Fishing rocky shorelines and mid-lake shoals with lots of boulders will net you fish up to 10lbs. For trophy class Lake Trout, moving up to spawn means moving from the bottom of the lake up to rubble spawning grounds in the 20-40ft range. Look for single “hooks” on your fishfinder and these will most likely be the beasts of the lake! Jig em up! 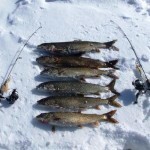 Lake Trout are enjoying cold water throughout the lake and are again roaming anywhere. Concentrate. A long drop-offs, around mid-lake structure and sandy bays. Fish water depths from 10-40ft. Not always concentrating on the bottom. 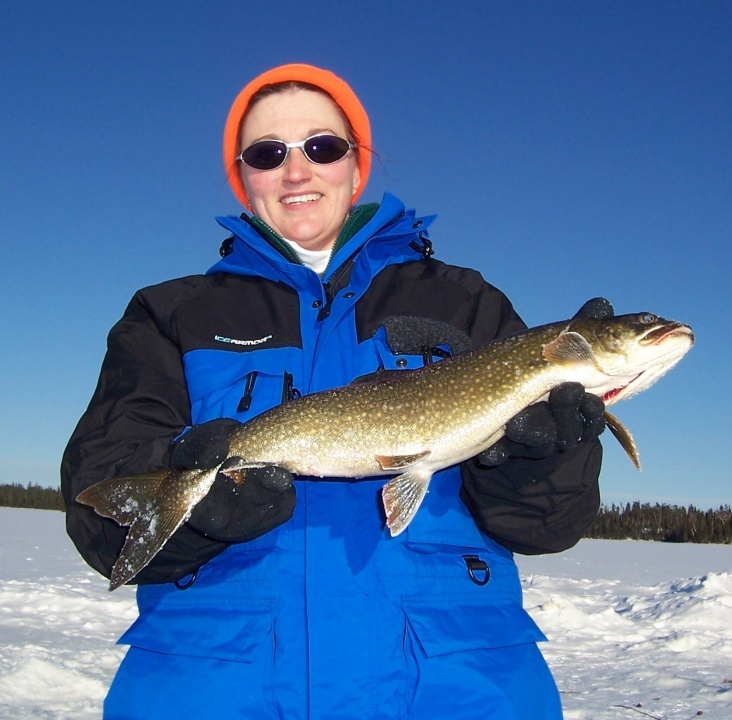 The number one lure for winter Lake Trout is a white tube jig. In Northwestern Ontario you are allowed two lines in the winter. I will jig one and have the second rod or tip-up set up far enough away so the two lines are unlikely to tangle when a fish runs. On my still line, I will use the same rig I use when “soaking bait” in the spring. Leave it on the bottom or bring it up to a desired height so the minnow swims freely 2-3ft off bottom. When jigging, I like a 3ft medium heavy to heavy rod. Some anglers will use a regular 5-6ft summer rod for a longer jigging stroke. I like using Berkley Nanofil line because it is thin, doesn’t stretch and is smooth reducing the water droplets from freezing on the line while jigging. Favourite jigging lures are a white tube jig, jig/minnow, airplane jig, Little Cleo, Williams Jigging spoon. Lower your jig to the bottom and start jigging. Keep your line taught on the way back down. Reel up a bit and jig some more. Just like in the summer. Be ready to set the hook. If you set the hook and think you missed, then feel another hit and set it again and miss. You most likely set the hook on a small fish and literally yanked it up in the water column. Then you felt it again so you set it again. Be sure to set the hook and then start reeling until your rod bends over and starts working the drag. I love using fly fishing reels on my ice fishing rods. Less line curl and better drag systems. Open face reel drag systems don’t like our cold climate and always seem to miss a beat and chatter. 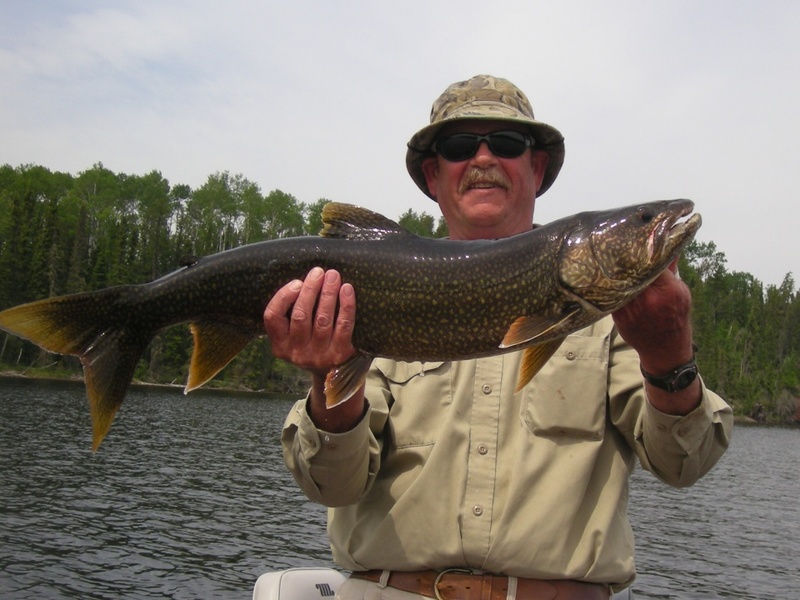 When you do catch a Lake Trout and bring it up through the hole, use a Lindy Glove to grab the fish by the lower jaw and remove the hook while the fish is in the hole. Then pull the fish out and support it under its stomach for a quick photo before releasing. 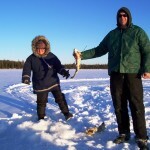 Don’t let the fish touch the frozen ice around the hole unless you plan on keeping it for the table. 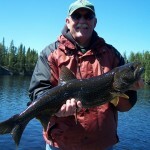 Fly fish for Lake Trout during the spring and fall seasons when the Trout are up shallow. Use an 8-9 weight rod with a good reel spool with plenty of backing and a sink tip fly-line. Use large streamers to imitate minnows or weighted strip leeches with some tinsel or any pattern with a rabbit strip wing. The undulating of the rabbit fur makes the streamer come alive! Watch the boat cause once hooked, they are going to head for deep water! Summer fish need to return to cold water as fast as they can.